Patrick Lynn Mills, resident of Tonkawa, passed away on Monday, January 28, 2019 in Tulsa. He was 70 years old. Patrick was born in Ponca City, OK on August 2, 1948 to his parents, George Chesley Mills, Jr. and Betty June (Wilson) Mills. He grew up in Tonkawa and, after graduating from Tonkawa High School, enlisted in The United States Navy. 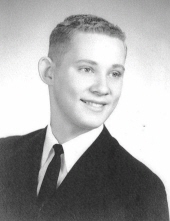 Following his honorable discharge from the military, Patrick came back to live in Tonkawa. Although he was a farmer at heart, he also worked for several years at Kay Electric. Patrick loved living in the country and enjoyed gardening and tending to his chickens and tomatoes. Patrick was preceded in death by his parents, George and Betty Mills and his brother, George Chesley Mills, III. He is survived by his son, Chris Mills and wife, Theresa of Tonkawa and his sister, Helen Rogers of Muskogee, Oklahoma. Patrick was a good man who will be missed by those knew and loved him. Cremation arrangements are under the direction of Trout Funeral Home and Cremation Service of Tonkawa. To send flowers or a remembrance gift to the family of Patrick Mills, please visit our Tribute Store. "Email Address" would like to share the life celebration of Patrick Mills. Click on the "link" to go to share a favorite memory or leave a condolence message for the family.